Kumiko Shiratori, Nanami Sakuraba and Emiko Kawamura are quirky gals in SABI♂SABI♀ - Quirky Guys and Gals. 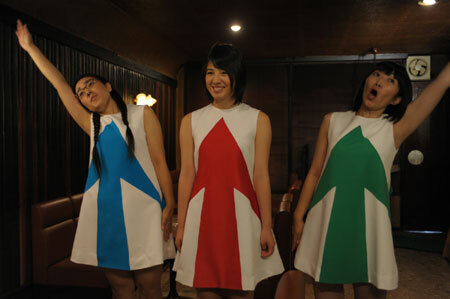 The Skinny: Uneven but amusing J-comedy omnibus from four Japanese directors, two male and two female. By turns absurd, satirical and warm, SABI♂SABI♀ - Quirky Guys and Gals earns its title and audience goodwill handily. As the title suggests, SABI♂SABI♀ - Quirky Guys and Gals is about a menagerie of odd and hopefully amusing boys and girls. Director Yosuke Fujita, whose Fine Totally Fine is a gem of recent Japanese comedy, starts this four-segment comic omnibus off with Encouragement Girls, about a three-girl cheer squad who use choreographed cheer routines to encourage mopey losers. The challenges facing these individuals can be minor (one guy can't open a jar) or major (one person needs help working up the courage to commit suicide), and lead cheer girl Chiharu (Nanami Sakuraba) has her own crisis of confidence along the way, but the girls give it their all. Is this inspirational? Not at all, but with deadpan absurdities, purposefully stiff acting, comic violence and some welcome black humor, Encouragement Girls earns its giggles handily. Next up is Boy? Meets girl, about a wallflower named Konosuke (Aoi Nakamura) who desires to win the heart of Kaori (Misako Rebutsu), the most popular girl in his class and an ardent member of the photography club. He thinks she doesn’t notice him, but that's not true – she does, though she pays far more attention when he starts crossdressing. Konosuke becomes Kaori's regular model, making him temporarily happy, but before long Konosuke wants more from Kaori than attention through a SRL lens. This second segment is essentially a manga staple brought to life, and director Tomoko Matsunashi accomplishes about as much as your standard 26-episode shojo anime in a fraction of the time. That is, she accomplishes little besides blissful, inoffensive entertainment. Director Mipo Oh threatens to upset the apple cart with the third segment, Claim Night!, about a lonely woman named Mayuko (Tomochika) who comes home one evening only to find her power shut off. After berating the electric company CS officer, she receives a visit from a company ombudsman (Tenkyu Fukuda), who she then tries to seduce over a fine meal of pork shabu shabu. Claim Night! possesses perhaps the most recognizable character in Sabi Sabi, as Mayuko’s hypocritical emotional extremes make her an exaggerated satire on real-life quirky boys and girls. Sadly, those emotions also make Mayuko a chore to spend time with. There’s ironic and dark humor here, but also a familiarity that borders on uncomfortable. Thankfully, Gen Sekiguchi (Survive Style 5+) shores things up with the satirical and absurd House of Suits, starring Kyoko Koizumi as a housewife whose charitable nature impels her to collect strays. The problem: the strays aren’t cats, they’re out-of-work salarymen who usually kill working hours in parking lots and playgrounds rather than admit to their wives that they’re unemployed. Sekiguchi never leans towards the dark side of his satirical situation, instead opting for a light and amusing irony that’s simple and funny. In the lead, Kyoko Koizumi is all cheery radiance, giving her could-be twisted situation a sincere, winning heart.